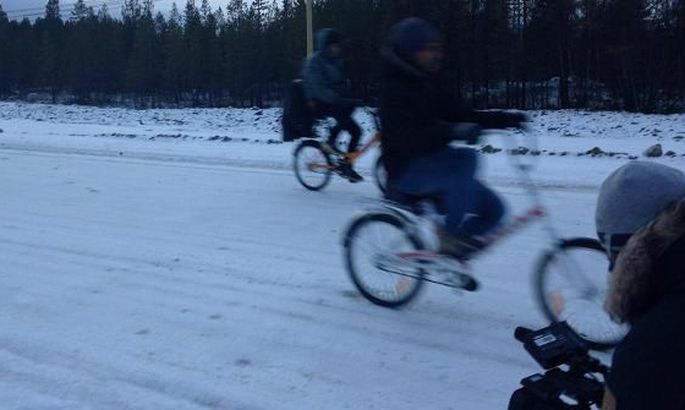 Many asylum seekers in Norway cross the border on bikes because crossing the border on foot is prohibited. Migration – into Nordics and out of Baltics – poses considerable security risk to Baltic Sea Region (BSR) as admitted by freshly released research ordered by Swedish defence ministry. «Europe is currently facing an ‘avalanche’ of migrants and is struggling to coordinate a collective response; numbers have vastly exceeded nations’ expectations,» admits the study headlined «Future Security Challenges in the Baltic Sea Region». «Not unreasonably, migrants often desire to live in communities of shared identity and understanding, not least because of language and cultural considerations. However, this tends to slow down integration into the host community and may lead to isolation and, more so for adults, a failure to learn the language of their new home,» continues the report. «The consequent clusters of immigrant groups often give rise to tension with long-settled residents, who resent migrants for: changing the character of the area in which they live; competing for jobs; monopolising services; and competing for limited government resources. Notwithstanding the likelihood, or otherwise, of migrant groups becoming a majority, it is likely that current trends will continue, their numbers will grow and, in the longer term, diasporas are likely to form and become organised. Depending upon the size of such communities, the political balance of the host country could be affected; the national intent of nations may be subject to change should large communities of any particular heritage gain a voice. The relatively low indigenous population densities in the region could exacerbate this effect. Another possible future concern is that organisations espousing anti-global, anti-western ideology (such as that of the so-called ‘Islamic State’) may find traction and support in diaspora communities. It is possible that such ‘jihadist’ beliefs will appeal to those who might otherwise feel isolated and not fit in to western society and become a threat from within. While the current influx of refugees from Syria and other conflict-torn countries is often described as a crisis (implying a short-term problem), the flow of migrants to Europe is clearly a long-term, ongoing issue and is unlikely to abate in the future. Addressing migration will require concerted action from many states involving more than physical prevention or the determination of where migrants should be allocated. A long-term solution requires intervention in the country of origin. However, establishing communication paths and connections, encourages and enables migration. Reducing migrant flows (which realistically requires developing and improving the quality of life in migrant homelands) is likely to be a lengthy project. Moreover, such involvement may need nations to reconsider how, and when, they are willing to use their armed forces. In Germany, 150,000 people arriving every month has led to a reorientation of foreign and defence policy with consideration of interventions overseas to prevent states from collapsing and ensuring as ‘few refugees as possible embark on the long journey to Germany.’ Increased migrant flows also have the potential to cause friction between states as migrants flow from one state to another leading to perceptions of bad behaviour by a neighbour ‘shifting the burden’ or refusing to pull their weight. Latvia, separately underlined, for instance has a population of which only 63% is of working-age; this group declines by 1.5% per year. Over the past decade, about 220,000 Latvian residents emigrated to other countries, and currently more than 10% of Latvians live abroad. Although this initial demographic problem could be aided by inward migration, this would also reduce the proportion of ethnic Latvians living in the homeland. The BSR will be subject to a number of security challenges in the future. Whilst the global trends forecast in GST will have varying impact on the region, Russia’s behaviour will remain the pivotal factor in regional security. Based on analysis, our key deductions for BSR security are listed below. a. The Baltic Sea Region will remain of strategic importance. The Baltic Sea is one of the busiest shipping areas in the world; the volume of maritime transportation navigating it has doubled in the last twenty years. Energy shipments from Russia are particularly important and the entrance to the Sea, through the Danish Straits, is one of the world’s eight strategic oil transit chokepoints. The Nord Stream gas undersea pipelines from Russia to Germany are also an important strategic element in the BSR. b. Investing in renewable energy and other environmental protection measures may lessen the effects of climate change. However, climate change is likely to have a significant security dimension. c. Cooperating and investing in innovation will enable countries in the region to achieve a technological edge against greater Russian defence spending. A mastery of the information environment and cyber-warfare will be paramount. d. Energy dependencies within the BSR vary, with nations having different energy strategies, and most importantly, varying degrees of dependence on Russia. Measures to reduce relying on Russian energy are strategically sound, although it should be remembered that the Russian economy is dependant on the energy market. Significant reductions in demand may, therefore, have a major effect on the Russian economy, and potentially, have a destabilising effect on regional security. e. Migration is likely to remain a major security challenge into the foreseeable future. Trends are complex, ranging from the large influx of migrants from the Middle East into Sweden and Finland, for instance, to the net outflow of working-age citizens from the Baltic States and Poland. f. NATO is likely to remain the key western security institution in the BSR, although European nations may be required to take more responsibility for regional defence as US priorities shift elsewhere. Regional defence cooperation will be essential; the Northern Group, for instance, will increase in importance. g. There is a marked disparity between Russia and the other countries in the BSR in regard to corruption. Measures to reduce the effect of this Russian corruption on the economies of the region remain vital. h. Whilst the significant Russian ethnic diasporas in Estonia and Latvia are a potential source of unrest, especially given Russia’s stated policy of ‘protecting compatriots everywhere’, economic realities appear to be reducing this likelihood. However, new ways of including the Russian speaking minorities in these societies would aid integration and lessen future friction. i. Much of the activity within the BSR will take place in individual nations’ exclusive economic zones. The littoral, multinational, and cross-agency nature of the operating environment means that operational success in the BSR will not only require a high degree of coordination between maritime commanders and their land and air counterparts, but also international and cross-government cooperation. j. The BSR is well suited to the effective employment of A2AD capabilities given its constricted, connected, littoral nature; the Russian inventory already contains conventional A2AD threats. Deploying S-400 surface-to-air missiles and the potential to deploy Iskander short-range ballistic missiles and the Bastion coastal defence missile in strategic areas, indicates an intent to use A2AD methods. k. It will be essential to maintain defence spending to deploy modern, agile and capable forces, although pooling and sharing arrangements may be vital to maximise capability. Close coordination and liaison between governments, agencies and armed forces will be key. l. There is a significant disparity between Russia’s prospects in the medium- to long-term and its view of itself as a ‘great power’. m. Ambiguous approaches to warfare could undermine cohesion and seek to slow decision-making. Vladimir Putin’s centralisation of power, coupled with his desire to expand Russian influence, has led Russia to adopt the strategy of ‘New Generation Warfare’. In support of this, Moscow has established the National Defence Management Centre of the Russian Federation – a strategic-level command headquarters which is intended to coordinate activity across a range of government departments and organisations to achieve Russia’s goals. Countering ambiguous warfare will require indicators and warnings and a high degree of understanding of the region and one’s adversary. n. The importance of territorial defence remains paramount.